Admittedly, at my age, my recollection of those heady days of the early Eighties era is a bit hazy. Seattle's Q5 simply doesn't come to mind. Nope. Never heard of them. Their history is detailed, and you can read the long version elsewhere (probably on their Facebook page). they got their start in 1983, cut Steel The Light the next year to some acclaim, and then toured with the likes of Twisted Sister and Lita Ford. A few years later the band went bust, only to resurface in the Nineties as Nightshade. Fast lane to recent times, and we find Q5 in Sweden doing a one off show at Sweden Rock, which leads to a reformation and resurrection of the band. The result is a new album in New World Order for Frontiers Music. With the first stream of their tunes, I had a dominant first impression. With the timbre of Jonathon K's vocals and inherent boogie rock groove, Q5 sounded like another AC/DC clone. Having never heard their first album, it could be possible that that was the sound they were after from the start. Not enough information for this, just some thinking outloud speculation. But then moving through New World Order, I heard something additional. Essentially, the influence of the New Wave of British Heavy Metal was my first thought. 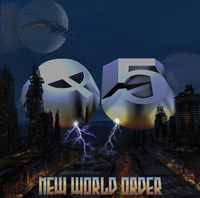 So now Q5 sounded like AC/DC transported to England, washed through NWoBHM twin guitar harmony and rock groove, and then possibly mated with Praying Mantis. Fundamentally, Q5 is a conspicous blend of classic hard rock and melodic metal, invigorated by the aforementioned "down under" boogie rock groove, and offering some fine ripping guitar work. You hear this in We Came Here To Rock, The Right Way, Unrequited Woman, Fear Is The Killer, and Just One Kiss, to name a few highlights. I think the only downside for me was that some were to long like We Came Here To Rock, which could have been trimmed by a good minute, or just simply plodding like New World Order, A Prisoner of Mind, where the background vocals seemed forced, or Land Of The Setting Sun which, if it were any slower and chugging, could be doom rock or metal. Yet then there was the curious "X" factor for me which is this: was Q5's album so inspired and attention grabbing, so consistently entertaining, that I would want to listen to it again, later as it were, put in some rotation? Probably not. But that doesn't have to be your conclusion. There's four singles out their in the cloud, check them out and you may hear and see things differently. 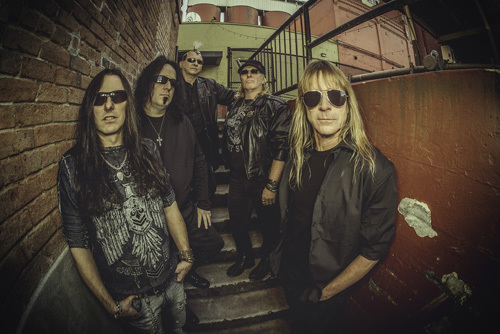 Fundamentally, Q5 is a conspicuous blend of classic hard rock and melodic metal, invigorated by "down under" boogie rock groove, and offering some fine ripping guitar work.